When I tried to find a blueberry muffin recipe to mix up I was VERY disappointed with what was out there. So I did some hard planning and what I mixed up was F***ING delicious so I had to share. Playing with vanilla cupcakev2, cake batter and sugar cookie as a base I built up the the authenticity with meringue and hazlenut and of course my all time favourite blueberry FW! Great shake & Vape but the recipe does change a lot after 2 weeks and flavour becomes richer and darker, I could Vape this for weeks on end! This reminds me of a Blueberry Belvita crisp, but without the flaky texture. Not quite a muffin. Damn good vape, though. Good recipe here. I'm almost through my first 30 ml batch. I do think it leans more towards cupcake than muffin but either way it's a great vape that I can easily keep in my tank all day. By far the best BBM recipe I have tried. I do not find any of the flavors to be overpowering as it is well balanced. The blueberry has a nice blend of natural and baked just like an actual muffin. The only reason I could not call this a perfect blend is that I find it lacking in the muffin taste/texture area. It needs something to bring out a little more oomph to it. I'm gunna agree with Loonicorn's review here in that the bready part of the profile is a bit more dry like a cupcake rather than a thick muffin. But overall the vape is great. I've discussed with ID1OT before that I think the use of cake batter is crucial to the gooeyness of a good muffin, so definitely hit that note right. But I think maybe a bit of custard or poundcake would have really helped solidify the recipe. Great recipe! I actually did FW BB at 3% and FA Bilberry at 1%, but what can I say, I like the added zing FA Bilberry gives. 5/5 either way. I would say you could tweak the blueberry part to your preference, or even throw in your favorite fruit blend, but that muffin sensation is absolutely stellar! Very tasty recipe. I did have to use v1 of the Vanilla Cupcake and that may make it a bit different. I made a vanilla cupcake recipe last year that uses the same combo of cupcake/cake batter/cookie for the base, so to me it tastes like a blueberry cupcake rather than a muffin but still delicious. Nice job! Very impressive as a s&v. Can't wait to try after steep. I'll try and report back in a week. This is one of the best BB Muffins I have tried. I loved every bit of it, minus some sort of off note that I get. No one really seemed to get it other than me, and I cant place it. I think it comes from the Cake Batter/Vanilla Cupcake mix. It is a very good vape though, and I did enjoy it as much as I could. Fantastic muffin recipe, and I too used CAP vanilla cupcake V1. I also added FA billberry at .5%. My third time making it I went for the 120 ml! Thanks for sharing! I used vanilla cupcake V1 and this juice was very good! It totally reminds me of the "vapor in a bottle" juice called blue bread. Thanks for the recipe. After some steeping, this is amazing. I also used Van Cupcake V1. 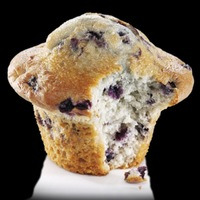 Have you tried flv blueberry muffin?